The recent prolonged spate of hot weather has given me a good chance to do some proper sunscreen testing. I’ve tested matte ones, mineral ones, budget ones and ones that require a second mortgage; moisturising sunscreens, apply-once sunscreens and mists that are perfect for a top-up. I cover half of my face with a “control” sunscreen. Which sounds highly scientific but really isn’t. Half of my face wears this control SPF, one that I’m very familiar with, and then the other half tests the new stuff. This might sound utterly barmy, but it helps me to rule out weird, isolated conditions that might affect my opinion – for example, my face being particularly dry one day, or uncharacteristically greasy. It could be that a new serum is creating havoc with anything I apply on top of it, or that I’ve accidentally left a cleanser on (has happened) and my skin feels ridiculously tight and tacky. If I don’t wear a familiar sunscreen alongside the new one then I find it quite difficult to make objective observations about it and draw comparisons with the other products I’ve tested. 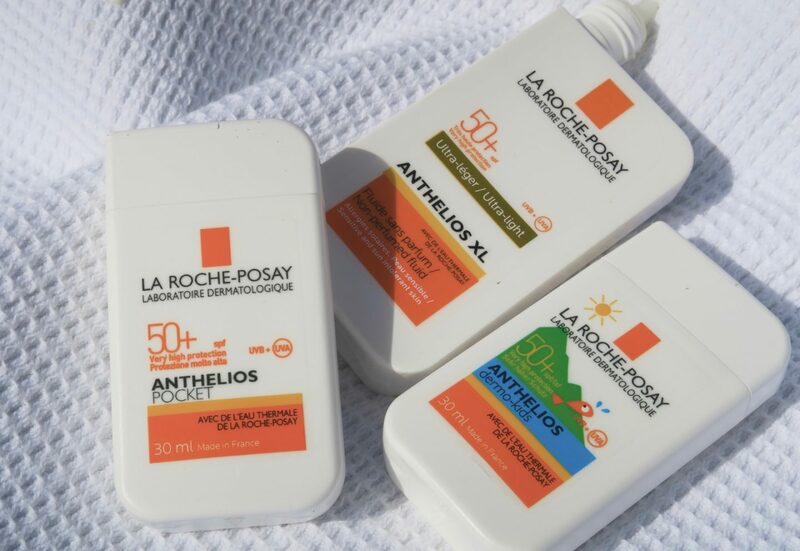 And the sunscreen that I’m so familiar with that I could probably pick it out from a hundred others with my eyes closed is the Anthelios XL from La Roche-Posay. This is a velvet-finish, non-chalky sunscreen with broad spectrum SPF50 protection (UVA and UVB, so protection against the rays that Age and the rays that Burn) and it’s unbelievably lightweight. I’ve been using it for years and prefer it to the other products in the Anthelios range (the cream and the anti-shine versions) because it sits the most smoothly and invisibly beneath makeup. Anyway, I’ve mentioned Anthelios more times than I talk about Mint Choc Magnums so regular readers will be no stranger to this recommendation; I suppose I just wanted to give you my sunscreen testing methodology before I began the reviews proper. which tickles me no end, because you can hardly get more pocket-sized and handy than the original. The no-frills, flat bottle is just perfect for holiday or makeup-bag packaging and there’s no ridiculous packaging excess either on the bottle or lid. Anyway, Ode to Anthelios over: you can read previous sunscreen reviews by clicking here but I’ll be back with more shortly. Let’s just hope the sun stays out, I’m not finished with this heatwave yet! Find Anthelios Pocket Sun Cream here*. Anthelios Ultra for sensitive eyes and Anthelios dry-touch gel ball up whenever I attempt to sweep my foundation over. Without anything beneath the sunscreen. I will give XL a chance in the hope it doesn’t pill. i once used this products some years ago and it used to peel in small particles when rubbed a little on the face.has it improve in that aspect? i love lrp filters though and i use the dry touch spf 50 cream which does’nt peel. I love Anthelios XL but i do find it needs to be shaken well before use and sometimes it has a weird feeling when applied. I live in a hot humid climate and the best spf 50 sunscreen that is a moisturiser, primer and sunscreen is from Alpha h! Bit pricey and it fees thick but once on, it gets absorbed quickly. In my opinion Australians know which sunscreen to us. Not only has sunscreen been part of goverment policy in schools since 1990s!!! But most of the population uses it. And it will never pile under any makep etc. I’ve used this for a few years now, and recently bought the Anthelios 30 Anti-Shine to try, but can definitely tell the difference – it’s slightly less runny and sometimes leaves a chalky finish. XL 50 all the way! Have used this suncream for years now – I love it but am also keen to try the new gel and water based ones from Asia which Sali Hughes recently wrote about. The new Anthelios Face Mist works very well as a top up over make up at lunchtime. It feels like spraying water on your face – so lovely! Ruth. Fair play on your efforts to test stuff. But would you not be afraid of the ross effect? I’ve used Anthelios for years – the comfort one, as my skin tends to be dry. But in the last year or so I felt it just wasn’t working as well and I have a lot of new pigmentation, even when wearing a hat. Maybe that just happens with age. I’m using Heliocare during the week (when I’m mostly in an office) at the moment – I like the slightly tinted finish and don’t need to wear foundation on top. Still using the Anthelios at weekends when I reapply during the day – just wish something could completely block the sun! Biorés watery essence SPF 50 is something else I have been testing, because it is a lot cheaper, and I dare say it is quite as good as the Anthelios Fluid. Feels more like a gel than a cream though, and might feel sticky if you use a big amount. My go-to one is the ISDIN Fotoprotector Fusion Water SPF 50, but this one is one that I have been meaning to try forever. I always get bad bad pimples on my chin from Anthelios XL ultra-light sunscreen. I’m using Supergoop’s Everyday sunscreen in SPF 50; it’s fragrance-free and moisturizing. I only use it on my face, neck and chest because it’s one of the few top-shelf products I own and I want to make it last. For the rest of me I use Hawaiian Tropics Ultra Radiance but I looking to switch up as soon as I finish the small bottle because I think the fruity fragrance attracts gnats, and that’s not fun when running outside. I looooove La Roche Posay, the Effaclar A.I. (targeted imperfection corrector) does a very good job also!!! For me the only stuff that works. Love the lengths you go to for testing, Ruth! I really liked the Anthelios but it did ball up on me. To be honest I’m starting to wonder if it’s not just my skin – a LOT of products do that to me, regardless of whether there’s something underneath them or not. The dealbreaker though was that one day it just separated and no amount of shaking could get it to mix back together, so it would come out of the bottle as liquid first, then cream. I was pretty annoyed because I had about half a bottle left. I’m a big fan of Asian sunscreens personally. I find them the most comfortable to wear. I really enjoy using The Body Shop Skin Defence Multi-Protection Essence SPF 50, I find it really light and easy to apply, feels like it just disappears into my skin. I have oily/combination skin. Same here but with normal to dry skin :-) Was a recommendation by Caroline Hirons which made me test it and I have liked it ever since! Used tip for people who have oily skin and want to use the green one (matifier). Pump onto your fingers the desired amount, spread it out on your face and only massage it in one area at a time, I do check, check, forehead, nose and eyes. It wil become an absolute pain if you try to massage it like any otter spf. This way it wil work nicely under make up. The tecture is almost like a poeder, takes some time getting used to. Long time fan of Anthelios XL here! This long, hot summer I’ve been using the non-perfumed, dry touch gel-cream variant. It’s brilliant. No white cast, sits perfectly under foundation and doesn’t break me out. Can’t recommend it highly enough. 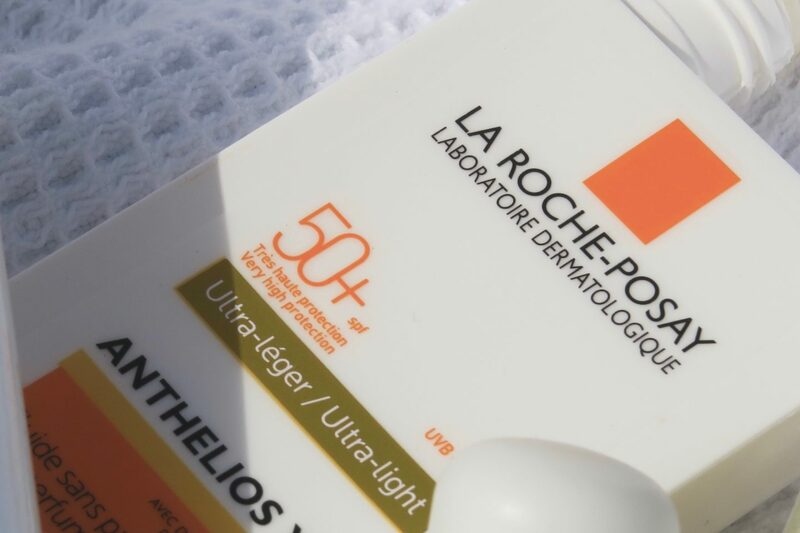 I’ve been using the Anthelios ever since they launched La Roche Posay in Canada. Never cheated on my face with anything else! The newer formulation is better. It gives an actual velvet finish – not matte, and shine free. For people who have problems with pilling a makeup artist gave me some good advice. I am aware that skin is a fickle thing and it can be difficult to figure out the right cocktail, just trying to help a fellow frustrated someone :) Aren’t we all in this together? 1. Asses you skins needs daily no matter what your skin type is! 2. People generally use way too much serum and moisturizer and therefore the SPF will ball up like carpet lint on your face. 3. Exfoliate regularly with a chemical exfoliator and stick with it, you won’t see results after one use. Once a week I will use the Clinique 7 Day Cream Scrub. I find my skin reacts better with a bit of variation. Really need to try that one! I bought a pocket size sunscreen for this summer and I am so happy with it ! It stays in my handbag and I have been using it so much more than usual ! I love this sunscreen too! For years I used Avene’s SPF 20 Cleanance Legere sunscreen since it was light and comfortable on my skin (acne-prone, combo, wears makeup). However, I knew I needed more SPF and UVA protection. Last year, I checked out La Roche Posay’s sunscreens. I found it hard differentiating between their sunscreens because they are so similar in their claims (anti-shine, ultra light, comfort). I gave their “comfort” one a spin and it was so thick and goopy. This year I decided to give them another chance and got the Ultralight XL version. I’ve been happy ever since! It works well on my skin and does not give me greasy skin or spots. I can wear it alone or under foundation. As expected, it pilled slightly over a silicone-based moisturiser I use occasionally. I try avoiding mixing too many silicones for this reason, but it helps to use patting motions instead of swipe-y ones when applying each step. Less disturbance. I really love the Cetaphil SPF 50, lightweight but moisturising and no chalkiness. I always found Anthelios a little difficult to ‘heat up’ and work into my skin. Plus despite being oily, it dried me out a little. This was a good few years ago so perhaps the formula has improved since then. I love these SPF’s. I have been using the Dr Dennis Gross one recently which I seem to get on with too.